Very possible 808 with decent tires. Power to weight is close to a 997 non s. I own a 964t w 14k original miles today, surprisingly well composed. The video was recorded in 1991 by Best Motoring. 964 is best of old/new 911\'s its also the lighter weight than 993tt due to rear drive, even n/a is lighter than standard 993. This is a true drivers car so the numbers I believe. yes that is definetly true, theres no way hat lap is legitimate, 808, with 320bhp and 3200lbs, from 1991? no way stock, even if it did have a really skilled race driver, either they was lying bout the power, had lightweight interior mods or thos tyres are not standard, somthing is not right here. that 8:08 lap time is a LITTLE hard to believe, are we absolutly 100% sure that cr was 100% bone stock???? surprising to read that a 964 turbo 3.3 could be faster on the race track then a 964 RS - so far i only heard the opposite, as the RS has some 200 kilos less to carry around. 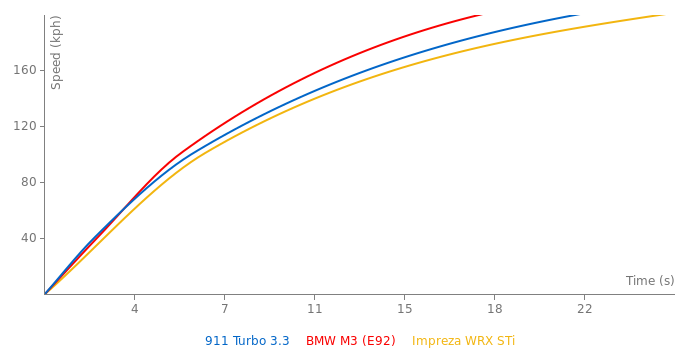 I own myself a 964 turbo from 91, and wonder how to "prepare" the car to be more efficient on the race track. Was this lap of 8:18 achieved with a standard suspension and engine? No my fault the 964turbo was not AWD... only the 964 Carrera 4, 964 Carrera 4RS (20time build) and the 964 "30years 911" edition was AWD, AWD was introduced at the 911 with the 1988 964 Carrera 4, the 964 was first avaible with AWD befor they lunched the RWD 964 in 1989 (1990 modelyear). Did the 964 turbo had AWD traction? I thought the 993T was the first 911 with AWD system. This was driven by a highly skilled race driver..and Mr Gan-San has over 6000laps northloop experience. sportauto clocked the 264hp 964 Carrera RS (RWD) driven by a car journalist in 8:26 in 1991... 60hp more plus AWD traction plus race driver vs car journalist.. cutting 19seconds of the 8:26 in 1991... not impossible..
Wow, that’s extremely fast for a 964, especially if we count that it was forced to slow down because of the road construction. Does anyone knows when this video was made? I think it’s in our days; a 964 turbo with early 90’ tyres couldn’t achieve that time. 8:08? Is that really correct? ?